SweetRush forecasts the important trends its thought leaders believe will make an impact on corporate training and instructional design this year. 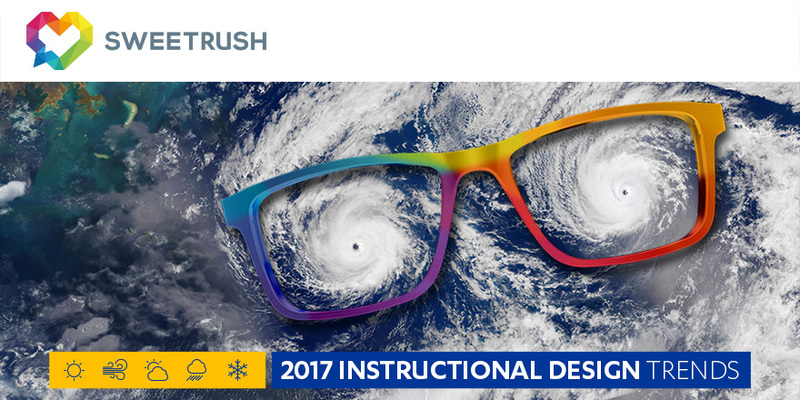 San Francisco, California, February 6, 2017—As part of its efforts to share knowledge and expertise with its peers in the industry, SweetRush recently shared an article with its predictions on trends for instructional design and learning and development in 2017. Tim Coffey, Instructional Designer and author of the article, asked a multidisciplinary team of experts at SweetRush what clients are asking for and what learners are responding to in the world of instructional design. The result, “2017 Instructional Design Trends Compass: Your Accu-Learningcast,” is published on eLearningIndustry.com. The article comprehensively describes six important trends and includes links for further reading, sharable quotes from the experts, and an infographic that offers a quick view of the highlights of the piece. Coffey uses weather as a metaphor throughout, which helps illustrate the forecasts and predictions in the article. Coffey says the perspectives of the SweetRush thought leaders will be of value to anyone working in instructional design or the corporate training industry. “Learning and development professionals provide clients and learners with high-quality learning assets as efficiently as possible. Technologies and the way we engage as learners are constantly evolving. Keeping up with those shifts is essential to good instructional design,” Coffey says. To read “2017 Instructional Design Trends Compass: Your Accu-Learningcast,” visit eLearningindustry.com, the site preferred by the learning and development experts in the industry, with more 500,000 unique readers per month.